Buying new tires can be challenging because most people don't know what to look for when buying them, nor do they know which ones will suit their driving needs best. Tires are the single most important safety feature of any car, and being a knowledgeable consumer helps you purchase tires that suit your car, driving habits, and budget. First, know when your tires need to be replaced. The "penny test" is the most common method used. 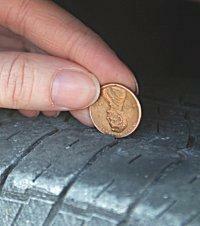 Insert a penny into the tire's tread, and the top of President Lincoln's head should disappear. If it does not, the tread is low and the tires need to be replaced. When using the penny test, check each tire in the center of the tread as well as on both the interior and exterior edges for uneven wear. Another indication that it is time to buy tires is to note any uneven wear, particularly on the sides of the tire where the interior belts may poke through. If tires are uneven, the car may pull to the side, or there may be vibrations or other handling difficulties. Most new tires come with wear indicator bumps, which are small threads of rubber along the tread. When these bumps wear off, it is time to purchase new tires. 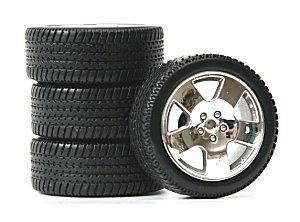 Purchase new tires in the fall before winter weather arrives. As tires wear, the surface area of the tread increases, which gives tires better traction in dry conditions, but makes them more hazardous in wet or icy weather. Newer tires provide better traction and control during the winter. All-season or all-weather tires: These are extremely affordable tires, which are engineered to perform well in all types of weather to a moderate degree, although extreme weather conditions may require specialized tires. Performance or touring tires: These tires are engineered for exemplary performance, visual appeal and style. They are often chosen for sports cars or luxury vehicles. Heavy duty or heavy load tires: These are typically more durable than regular tires and meant for vehicles undergoing considerable stress, such as rough roads, heavy hauling, or changing terrain. Consider the terrain as well as the weather in your area. For instance, if you live in the Pacific Northwest, tires must provide good traction in rainy conditions. If you live in Chicago, tires need to have good traction in the snow. For most cars, all-season or all-weather tires are safe choices. Replace tires with the same type that came with your car. The design, size, and brand information is printed on your current tires, including the height, width, diameter, speed rating, load rating, and other crucial measurements. Research where to buy new tires by checking the automotive section of newspapers for good sales on tires or look online. Have tires professionally installed. Auto shops have machines specifically designed to place new tires over the car's wheels without inadvertently causing damage. This is the perfect time to have the tires balanced and aligned if necessary. If you are buying tires from someplace other than your dealer, ensure that you are not voiding warranties or other protection programs covering your car. Know how to change the tires, and inspect and replace the spare tire at regular intervals. Check the inflation regularly to optimize performance and gas mileage and schedule routine balances and rotations. Properly cared for tires have a significantly longer lifespan and promote a fuel efficiency that results in hefty savings. Avoid buying mismatched tires because you'll have to replace them individually at different times, which means more trips to the auto shop. In addition, you may get an uneven ride, excessive wear on different tires, and other handling difficulties. To avoid mismatched tires, replace tires in pairs and put new ones on the rear tires first to provide the best possible traction with the brakes. This will also help the vehicle avoid fishtailing and other out-of-control situations. Discount Tire will set you up with new tires by year, make, size, brand or style. 1010tires is "the absolute tire and wheel authority" and provides forums, ratings, and reviews on all major tires, plus a glossary of tire terms. Kal Tire is a Canadian tire retailer with extensive information about buying and caring for tires, as well as an online tire finder and other helpful hints.